with Tear Away Cards for Laser and Inkjet Printers, 4¼" x 11"
Get your foot in the door without even knocking. Use easy to customize two-sided Avery® Door Hanger with Tear-Away Cards to promote your business and open the door to success. Each hanger is made of a sturdy card stock and features two micro-perforated tear-away cards that can be customized to offer discounts, seasonal promotions, rewards and more. 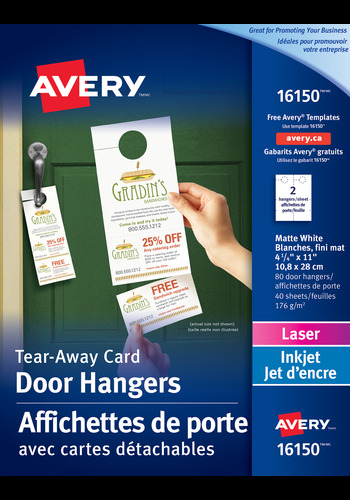 Use easy to customize two-sided Avery® Door Hanger with Tear-Away Cards to promote your business and open the door to success. Each hanger is made of a sturdy card stock and features two micro-perforated tear-away cards that can be used to offer discounts, seasonal promotions, rewards and more. Personalize each element to fit your marketing needs, whether you're offering coupons, or business cards. Print on either an inkjet or laser printer then easily separate the door hangers from one another without the need for scissors or a knife. Start designing an Avery® door hanger to fit your marketing and advertising business needs. Card Size 4¼" x 11"
Customizeable tear-away cards for customers can be formatted in portrait or landscape. Micro-perforated tear-away cards can be used for reminders and kept for future use. Create tear-away loyalty cards, business cards, coupons, promotional deals, seasonal offers, etc.